It has been so hot these past few weeks. I can't complain, because we had such a cool spring, but I must say it's cookin' in our house! Because of the heat, I've been spending a lot of time in our basement with a fan trained on me. Since I work from home, I can sit in front of the fan on the computer during the day and in the evenings, after my dog walk, errands, and supper, I park myself back in front of the fan reading or scrapbooking. Speaking of scrapbooking, I haven't posted many layouts lately, so I'll try and post a few over the next couple of weeks. I have actually been getting some Europe layouts done and have even thought of going to Costco to get more pictures printed. Crazy, I know. I put the layouts that I've got completed in albums last night and I have three albums worth all ready, with more to come. I think I'll do a fast mini album of Ottawa next. That's my project for after I finish the Europe album and inbetween all of the weddings, visitors, work, and trips that seem to fill up every moment of the summer. Perhaps that's wishful thinking. I also got my prize from Just Cre8 in the mail this weekend. I won a little challenge at their last crop and got a whole pizza box full of goodies. Yay! And I've all ready used some of the alphabet stamps on the layout below. 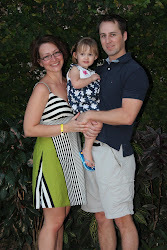 Now, I'll leave you with a copy of the Higginson family picture we took a few weekends ago. This is only the immediate family. 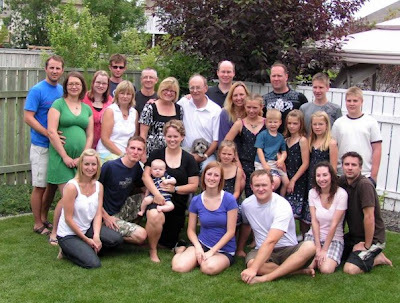 Yup, just Brad's parents, brothers and sisters, spouses and their kids. Huge, eh?! Can you pick me out? Hehehe. Bright green and super pregnant... easy to spot. The funny thing was, Brad looked at it and said, "Man, my cheeks look chubby in that picture." Really, your cheeks look chubby? Oh my goodness, you are preggers! Congratulations, I have been away for awhile, indeed! Summer is going quite nicely. I see yours isn't too bad either. Hope Edmonton is treating you well. I LOVE the Notre Dame layout! Thank you for having a link to the My Mind's Eye blog. Getting Ready and a Garage Sale!